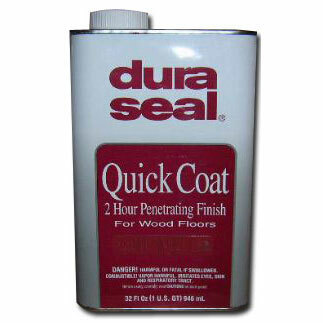 DuraSeal Quick Coat Penetrating Finish 108 Royal Mahogany Hardwood Flooring Stain is a semi-transparent stain formulated to seal, color and provide exceptional durability when used on bare wood and masonry surfaces. This rich blend of oil and resin gives hardwood floors a soft, satiny sheen. Its unique formulation provides a surface that can be topcoated in two hours. DuraSeal Quick Coat Penetrating Finish is available in existing DuraSeal colors as well as many Certified Minwax colors ( click to explore Minwax stains ). It can be used with or without a finish coat, and is compatible with all DuraSeal water-borne and oil-modified finish systems.